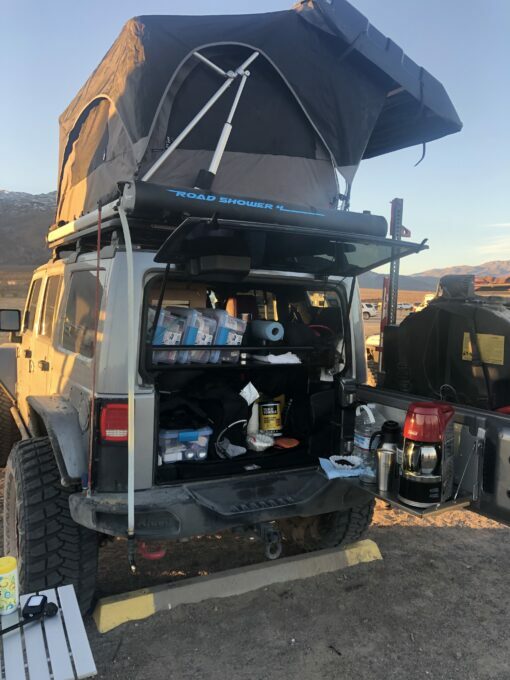 Special to ModernJeeper from Eileen Crowl who with her husband Gordon were awarded Best Camp Hosts on the 2019 ModernJeeper Adventure to Death Valley. Her personal insights into more than just Jeeping — but also the food, the fun, the campfires and the memories make for a great read. The featured pic is Eileen getting the frozen spaghetti sauce out of her Jeep. Enjoy. Gordon and I want to thank Matson Breakey for establishing ModernJeeper Adventures. We went on the first ModernJeeper Adventure last year to Moab and this year we were happy to join in on their Death Valley Adventure. We would probably never have done either of these off road trips if it hadn’t been for the planning and availability that was offered by ModernJeeper Adventures. I personally liked the Death Valley adventure better than the Moab adventure. The Death Valley adventure was a smaller group and because we all camped together each night we were able to get to know each other better. 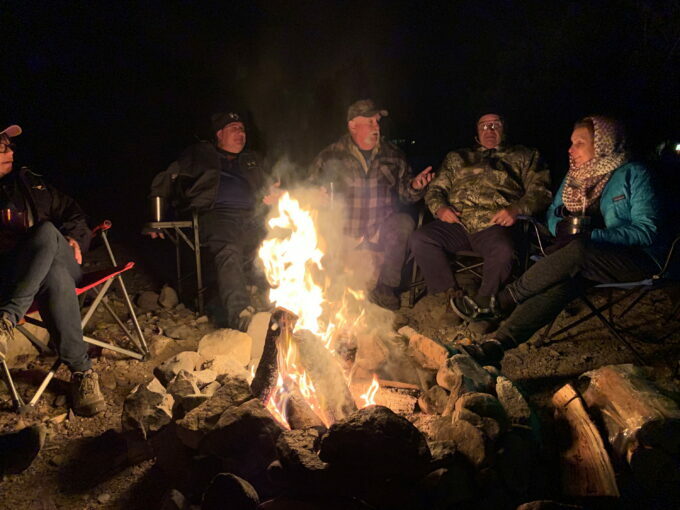 Our evening campfires in Death Valley were always a fun time of stories, bonfires and establishing bonds with people we are now happy to call friends. Another thing I liked was the combination of both off road/jeep rock crawling and exploration of the Death Valley National Park. 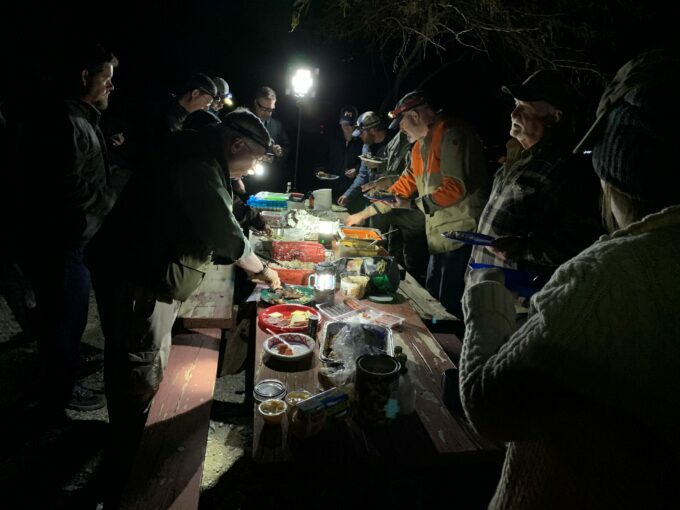 Our Guides, Tom Severin and Del Albright kept us entertained on the trail with tales of the history of Death Valley, geological formations, miners and ghost towns. While traveling along the many miles of road Tom and Del pointed out the landscape, historical facts, a few tall tales and some alien stories. We started the adventure in Lone Pine California the night of Feb. 23. This was a great way to start the adventure. All of us meeting a day early, in a hotel (comfort, before 3 nights sleeping in tents! ), having a great BBQ dinner and a good night’s sleep. Sunday morning in Lone Pine dawned cold but with gorgeous sunny skies and an incredible view of Mr. Whitney covered in snow. A catered hot breakfast by the Alabama Cafe was welcome and a great way to start the day and get all the information we needed before we set out on the road. 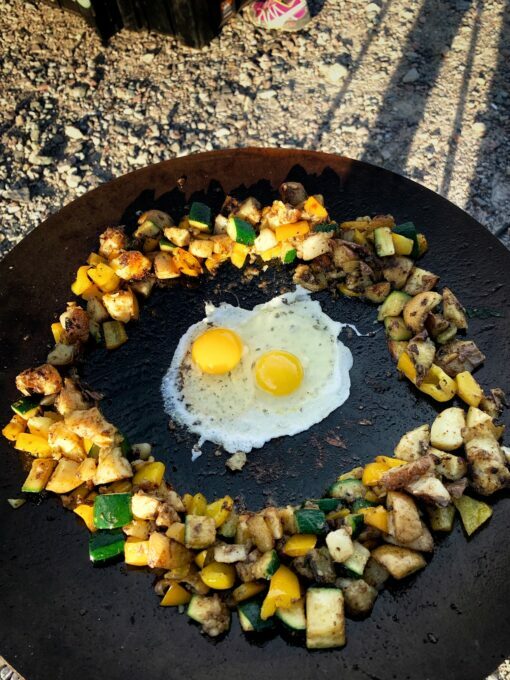 My favorite part of the trip was the nightly meals and campfires. 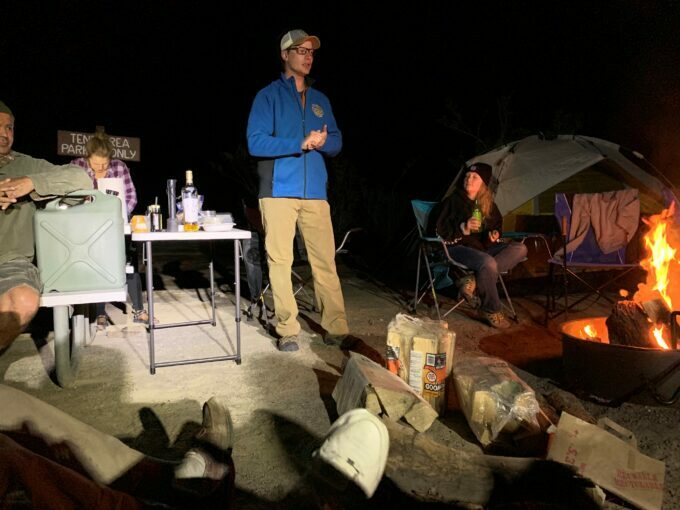 I am a food person, so when our friends Chris and Claudia from Colorado said they were going to eat dehydrated and freeze dried food on the trip, I stopped them and offered to include them in the meals I was planning for us. Planning for 2 additional people is not difficult for me. As it was we had enough food to include Tom also in our meals Monday night and Tuesday night. If I could have I would have cooked meals for everyone each night, as I do for our group that beach camps together every summer. For this trip I planned the following menu: Steak, baked potatoes and grilled vegetables Sunday night, Spaghetti and Naan bread Monday night and Ropa Vieja (cuban style pulled beef) with rice, beans and tortillas (plenty to share with Ross and Yvette whose own meal was not cooking as quickly as they would have liked). 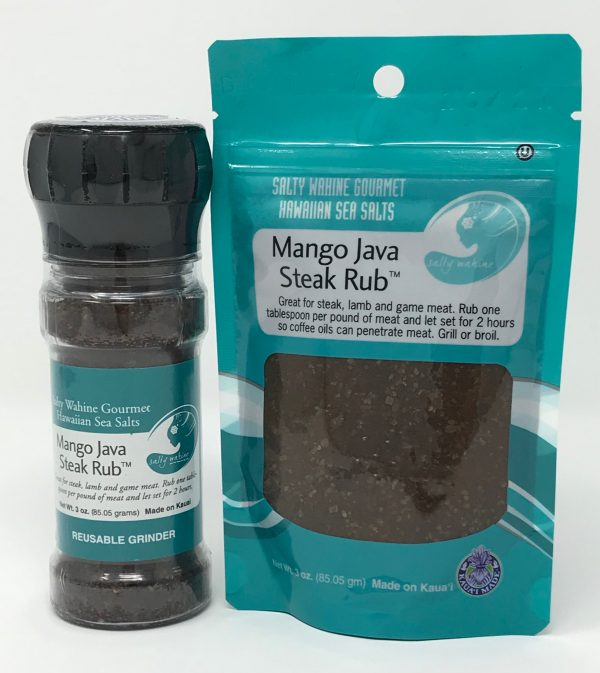 For Sunday’s meal the steak was marinated with a Mango Java Hawaiian sea salt and coffee rub vacuum sealed at home and frozen, so that it stayed nice and fresh by the time we thawed it for cooking. While thawing the rub works into the steak giving it an amazing flavor. The potatoes were wrapped in foil and placed over the coals of the campfire. Vegetables (onion, bell pepper, mushrooms, and zucchini) were cut up at home and stored in a vacuum sealed bag. These were placed in a aluminum half sheet pan with a little leftover bacon from our breakfast the day before, sprinkled with salt and pepper and seasoned salt (Spike), sealed with foil and placed on the hot campfire grate for approximately 35 minutes. Sunday was the day we shared side dishes which was what our vegetable bake was for. One camper commented that he doesn’t like zucchini but really enjoyed the vegetable bake! For Chris and Claudia I made a Greek Pasta Salad. Tom made us a Dutch Oven Peach cobbler-it was yummy. Monday’s spaghetti (a family favorite) uses Italian sausage, beer, balsamic vinegar and a LONG cooking time. This is so easy to take camping. We make the sauce ahead at home and then vacuum seal the sauce, laying it flat on cookie trays in the freezer. The sauce freezes into a nice shape that is easy to pack in an ice chest or for us, our soft sided Yeti bag. The noodles were prepared at home, then while hot , olive oil and butter were mixed in the noodles. The noodles were then vacuum seal as flat as possible and frozen. At camp I heated a pan of water, put the vacuum sealed bag in a bucket and poured the boiling water over them and covered the bucket with a towel while I cooked the sauce. When the sauce was ready, the noodles were warm and still moist, ready to be topped with sauce. Buttermilk naan bread warmed up on the stove in butter and some Parmesan cheese completed the meal. Tuesday’s Ropa Vieja is a Cuban dish. I like to plan a Mexican or Cuban themed meal when camping. They are easy to make ahead and freeze, saving time and prep at the campsite. As with the sauce I made the beef in advance, vacuum sealed and froze flat. The rice was cooked in advance, stir in a little butter, vacuum seal and frozen flat. As with the noodles, I placed the rice in a bucket and poured boiling water over, covered and let sit while I warmed the meat and a can of black beans. Tortilla’s that were frozen and vacuum sealed were thawed and heated in foil over the fire pit. I brought along a vacuumed sealed bag of shredded cheese and the meal was complete! I find meal prep for camping a challenge and a joy. Vacuum sealing and freezing flat takes up less space in an ice chest and because the food is already frozen it doesn’t melt our ice supply. We kept the nightly meals in a soft side Yeti bag with a bag of dry ice. Our food stayed frozen solid from Saturday morning until Tuesday. Our last nights meal was still frozen when I took it out to thaw Tuesday afternoon! We had dry ice in with our ice chest of ice cubes, unfortunately that was probably overkill for that ice chest, our eggs ended up freezing. We did learn that you can still use frozen eggs so our morning bagel and egg dish was not ruined after all. On a side note, our ice cubes were still frozen and cubes with no water by Wednesday when we got home! We always had plenty of ice for drinks, however, I would pack that ice chest in a more accessible place in the jeep on another trip, unfortunately even with all that ice, because our ice chest was not in an easily accessible area we couldn’t always get to our ice cubes. I hope you enjoyed my food tale of the trip. As I said, it was a highlight for me the evening meals. Campfires were held at our campsite and we enjoyed talking with all the jeepers and hearing everyone’s life stories. 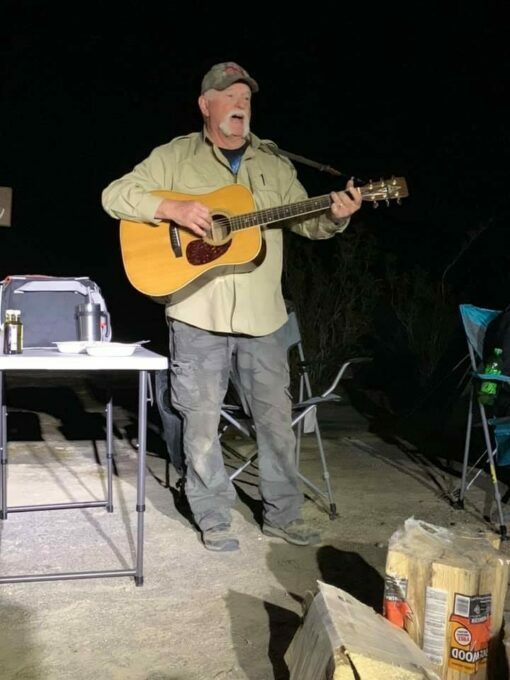 Del entertained us the first night with the “Story of the Joshua Tree”. Monday night Jeremy told us the story of his time as a cook and Gino entertained us with a true life story of the time he bought some calves and they escaped, forcing him to drive all over town to collect his stray calves! Del played guitar and gave us a rousing rendition of ModernJeeper (to the tune of Gloria). Then Chris and Jeremy regaled us with a very funny version of their side adventure from Sunday afternoon. Tuesday night we celebrated Claudia’s 20th birthday around the campfire with Gordon singing happy birthday accompanied by his ukulele, after which he played several more songs on the ukulele for us. When the fire died down everyone was happy, the wind had died down and it was time for bed. The last day of exploring was enjoyable and finding some fossils in a dry ocean bed was a great way to end the trip. Then the group split up going many different directions depending on where they lived or if they vehicle had been towed. Some went back to Lone Pine to pick up their tow rigs, some headed north to Las Vegas and we headed to Baker California. We saw another view of Death Valley leaving from Furnace Creek toward Baker. Once in Baker we found the aliens who Tom and Del swore were responsible for some of the rare occurrences of rocks moving on dry lake beds and other unaccountable phenomena (smile). I wasn’t sure what to expect when we signed up for this tour, I was pleasantly surprised in a very good way. We saw so much in Death Valley that most people would not and our guides took us to some tourist places, but the more spectacular places were the off road and off beaten paths explorations. I appreciated having maintained campgrounds with bathrooms and fire pits for our nightly camping. Thanks ModernJeeper Adventures. THANK you for pics, Eileen and Gordon, Brent Stanley, Wayne Bennett and Christian Wulfestieg. 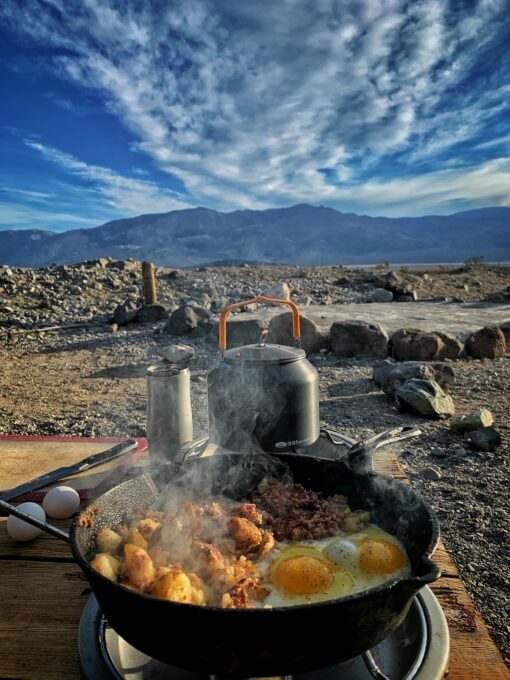 Read more about ModernJeepers in Death Valley. Great article. I especially enjoyed the food preparation and storage information. I will be incorporating them in my own travels. Very nice adventure for all of you. The information on the way to effectively store the food in ice is great! I’ll pass it on to the other members of my 4×4 club. Living in a desert does require adjusting to a different set of “facts; your facts make it very enjoyable.